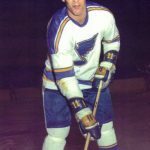 Any conversation about great hockey players from our area must include Barry “Hawk” Tabobondung! Even before it was known how he would soar on and off the ice, Barry Tabobondung became known as “Hawk”. It was a nickname that he picked up from his grandfather, and it became a great match for the skills that were passed down from his family heritage. His grandmother Flora, a member of the Order of Canada, was an honoured Chief for many years and his father Les starred with local hockey teams, including the champion intermediate Sundridge Beavers in the late 1950s. 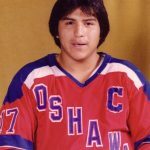 The Hawk showed outstanding athletic skills early in his life and easily excelled as a member of Parry Sound’s Junior C Shamrocks. Throughout his life he was known as a fierce and honest competitor; as daunting on the pitcher’s mound in fastball as he was breaking in over the blueline in hockey. 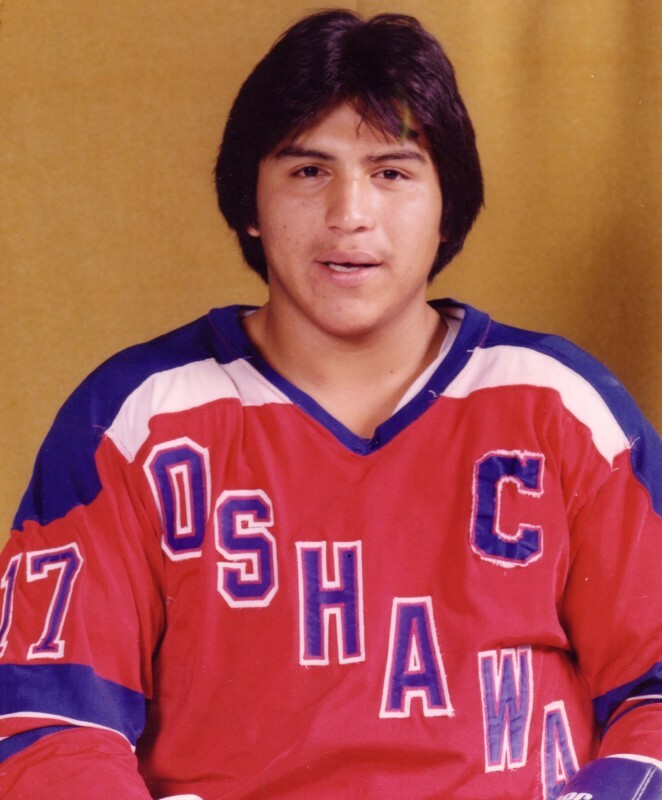 As a hard-nosed winger with great speed and a blistering slap shot, Hawk moved up to the major Junior A ranks in 1980-81, his draft year, in which he played with the Oshawa Generals. During his second season in Oshawa he racked up 77 points while spending 320 minutes in the penalty box. 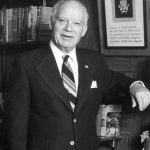 He was a born leader in just the style of hockey that attracted the attention of the Philadelphia Flyers. He became the team’s third-round selection in the 1981 NHL entry draft, #47 overall. 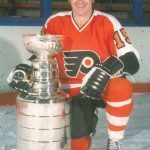 Never afraid of a challenge, Hawk applied his skills for two years with the Flyers AHL affiliate in Maine. 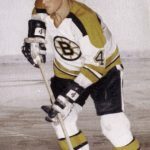 He then joined the Erie Golden Blades of the Atlantic Coast Hockey League where he played defence during three seasons. 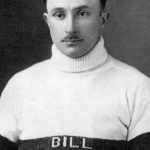 In his first year with the Blades, the team captured the league championship and Hawk was named to the Second All-Star Team. During the 1984-85 season, he was chosen as the ACHL’s Most Valuable Player and he was also named to the First All-Star Team. Before ending his professional playing career, Hawk spent the 1990-91 season with the Erie Panthers of the East Coast Hockey League. Upon returning to the Parry Sound area, Hawk applied his tremendous leadership skills on and off the ice. He shared his passion for hockey as a mentor to community youngsters and behind the bench with the Parry Sound Junior A Shamrocks and the Couchiching Terriers. Hawk gained the respect of his players and they were both inspired and encouraged by the direction in which he lead them. He served as a member of Wasauksing First Nation Council, was very active in the community and started a family with his wife Sharon. Barry Tabobondung died in a vehicular accident at age 39 in his native Wasausking First Nation neighborhood, July 11, 2000. The accident happened when Tabobondung and his 8-year-old son, Thomas, were riding in the cab of a road grater in which Tabobondung was working. The young boy fell out of the vehicle, and Barry jumped out of the cab to try to save his son from being run over. Both father and son became caught under the road grater’s rear tires. Barry Tabobondung was taken to the West Parry Sound Health Centre, where he was pronounced dead. His death wasn’t in vain. Police on the scene confirmed that Barry’s death was not in vein stating there was no doubt Barry had managed to save his son’s life. Thomas suffered a broken leg. A banner of tribute now hangs in the Bobby Orr Community Centre where a capacity crowd gathered for Hawk’s memorial service. He will always be remembered. Hawk was a hockey star in his playing days, but earned the right to be a Parry Sound hockey hero through his community involvement as one of Parry Sound’s best hockey personnel.